Remember that lovely Roll-themed coffee mug from the other day? 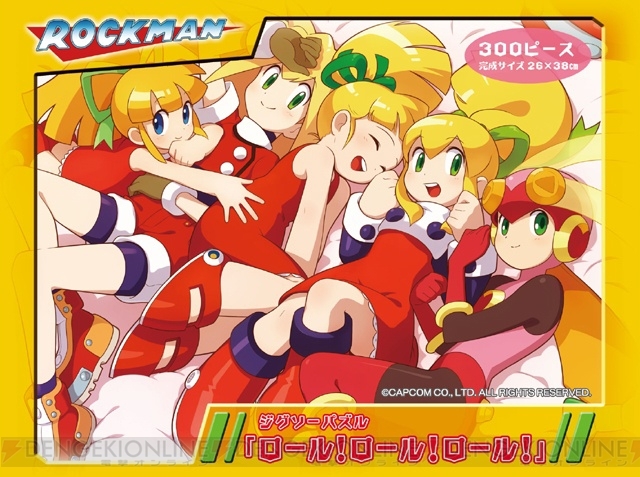 Kotobukiya, seeing that the collage of Rolls would prove to be popular with the fans, are using the artwork for an upcoming 300 piece jigsaw puzzle set aptly titled "Roll! Roll! Roll!" For those wondering, there's five iterations of Roll in this illustration. From left to right: Powered Up Roll, Roll Caskett, classic Roll (Pre-Mega Man 8), classic Roll in MM8-MM10 attire, and Roll.EXE. The set will be available for purchase at next month's Winter Wonder Festival in Japan for 1,890 Yen (or or roughly $22.76 USD). Unfortunately, there's no word if this will be sold outside of the event. Kotobukiya's supposed event- exclusive coffee mugs will be sold at E-Capcom in late February, so perhaps the puzzle will see a similar mass production, too. If you're looking to score the puzzle or the mugs, I suggest checking out your favorite proxy bidding service; these Japanese-exclusive items usually find their way on the auction block sooner or later. that's, um a rather Loli cover. Now that I've had a look at it, it's completely innocent, but my first reaction when the page loaded was "WHOA WHAT THE". Someone help me out here... Are there three Rolls from classic? One is Powered Up, one is Roll's Classic look, and one is her post MM7 look. I love you Kotobukiya and your lolicon fetish. ...that's just adorable. Must have for me. Too much sweetness in one frameshot!! Tag I tried but I really don't know what you mean. @TAG: You mean pedo-grizzly?? hahahaha!! No Ruby-Spears or Megamix Roll? I'll never be able to say I finished it. Already it's got missing pieces nagging at me.